Here are some ways to earn linden dollars in the virtual world . . .
Shopping for any kind of goods and services you can imagine is one of the most-frequently-reported best features of Second Life. Even a person with a free membership still may need money to buy desired virtual stuff in-world. Inside Second Life, the virtual currency is the linden dollar – referred to as lindens or L$. Linden dollars are exchangeable for US dollars (US$) in a marketplace consisting of residents, Linden Lab and RL companies. 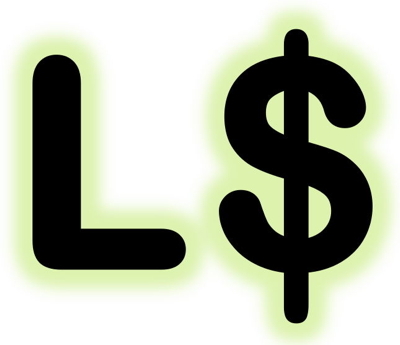 Linden dollars can be purchased in-world or in RL and transferred into SL. They can be sold for US dollars. The current exchange rate is around US$4 = L$1000. There are lots of ways to earn money in Second Life and new ways are being created every day. Unskilled jobs include dancer, model, shop attendant, greeter, bouncer and security agent. Search for and then travel to the shops, clubs and dance halls and ask for work. Generally, you have to have been an SL resident at least one month to be hired. Skilled jobs include builder, modeler, texturer, scripter, animator, fashion clothing designer, architect, home builder, furniture designer, weaponeer, vehicle designer, event host, DJ, stand-up comedian, trivia event host, salesman, and many others. These are real skills requiring knowledge, experience. and the ability to sell your services to others. These are part-time news reporters and feature writers, broadcasters and disc jockeys, professionals in public relations and advertising, as well as lawyers, economists, counselors and therapists. These are real professional jobs requiring knowledge, experience. and the ability to sell your services to others. These are full-time news reporters and feature writers who work for SL newspapers and magazines, broadcasters and disc jockeys who work for SL TV and radio stations, professionals in public relations and advertising who work for agencies and survey research firms. They also are lawyers, economists, counselors and therapists who run their own full-time service firms in SL. These are real professionals and their work requires knowledge, experience. and the ability to convince others to use your services. Entrepreneurs include developers who put up malls and business offices to rent space to other business persons, land barons who actually are real estate agents, linden dollar brokers, and organizers of groups, associations and companies. People with building skills make a lot of money in SL by creating content and selling it to other others for resale. Anything that can be made in SL or made outside and brought into SL can be sold: objects, clothes, scripts, animations, textures, vehicles, buildings, plants, skins, hair, and on and on. A good way to make more money is by selling goods to other residents. For instance, objects, clothes, scripts, animations, textures, etc. You don’t have to be able to build if you can buy from those who can. Anything that can be made in SL or made outside and brought into SL can be resold inside SL: objects, clothes, scripts, animations, textures, vehicles, buildings, plants, skins, hair, and on and on. When you hire yourself out to do work for another resident you are a contractor. Consider what you can do that others might not like to do for themselves, or not know how to do for themselves. Teach someone something. Any of the basic skills, intermediate skills, or advanced skills. How to build or script or get the most out of living inside SL. Either one-on-one or else host an educational event which instructs several other residents about how to use Second Life. Gambling is illegal in Second Life. It’s a violation of the terms of service (TOS). However, there sometimes are small cash prizes goods given away at small events. For instance, bingo, trivia, SLingo, Tringo, etc. If you pay Linden Lab for a premium membership to Second Life, you will receive a weekly stipend of L$300. There are FAQ guides to jobs in Second Life in Knowledge Base articles. You may have to log into SL’s Support Page to gain access.